Our solar system is a tiny but wonderfully familiar corner of the vast, dark universe – we have even been able to land spacecraft on our celestial neighbours. Yet its outer reaches are still remarkably unmapped. Now we have discovered 840 small worlds in the distant and hard-to-explore region beyond Neptune. This is the largest set of discoveries ever made, increasing the number of distant objects with well known paths around the sun by 50%. These little icy worlds are important as they help us tell the solar system’s history. They can also help us test the idea that there’s a yet unseen planet lurking in the outer solar system. Our planetary system as we see it today is not as it formed. When the sun was newborn, it was surrounded by a massive disk of material. Encounters with tiny, growing planets – including some of the worlds we’ve just discovered – moved the giant planets outward from the sun until they settled into their present locations. The growing planets, on the other hand, went everywhere, scattering both inward and outward. Planetary migration also happened in far away systems around many other stars. Fortunately, the celestial bodies in our own planetary system are comparatively close by, making it the only place where we can see the intricate details of how migration happened. Mapping the minor planet populations that are left over from the disk lets us reconstruct the history of how the big planets were pushed into place. The new discoveries were made as part of a five year project called the Outer Solar System Origins Survey (OSSOS). The observations, conducted in 2013-2017, used the [MegaCam] imaging camera of one of the world’s major telescopes – the Canada-France-Hawaii Telescope on Maunakea in Hawaii. The survey looked for faint, slow-moving points of light within eight big patches of sky near the plane of the planets and away from the dense star fields of the Milky Way. With 840 discoveries made at distances between six and 83 astronomical units (au) – one such unit is the distance between the sun and the Earth – the survey gives us a very good overview of the many sorts of orbits these “trans-Neptunian objects” have. Earlier surveys have suffered from losing some of their distant discoveries – when too few observations occur, the predicted path of a minor planet in the sky will be so uncertain that a telescope can’t spot it again, and it is considered “lost”. This happens more to objects with highly tilted and elongated orbits, producing a bias in what’s currently known about these populations. Our new survey successfully tracked all its distant discoveries. The frequent snapshots we made of the 840 objects over several years meant that each little world’s orbit could be determined very precisely. In total, more than 37,000 hand-checked measurements of the hundreds of discoveries precisely pinned down their arcs across the sky. We also created an accompanying software “simulator” (a computer model), which provides a powerful tool for testing the inventory and history of our solar system. This lets theorists test out their models of how the solar system came to be in the shape we see it today, comparing them with our real discoveries. The new icy and rocky objects fall into two main groups. One includes those that reside on roundish orbits in the Kuiper belt, which extends from 37au to approximately 50au from the sun. The other consists of worlds that orbit in a careful dance of avoidance with Neptune as it travels around the sun. These “resonant” trans-Neptunian objects, which include Pluto, were pushed into their current elongated orbits during Neptune’s migration outwards. In the Kuiper belt, we found 436 small worlds. Their orbits confirm that a concentrated “kernel” of the population nestles on almost perfectly round, flat orbits at 43 to 45au. These quiet orbits may have been undisturbed since the dawn of the solar system, a leftover fraction of the original disk. Soon, we will see a member of this group up close: the New Horizons spacecraft, which visited Pluto in 2015, will be flying by a world that’s about the size of London on New Year’s Day 2019. We found 313 resonant trans-Neptunian objects, with the survey showing that they exist as far out as an incredible 130au – and are far more abundant than previously thought. Among these discoveries is the dwarf planet 2015 RR245, which is about half the size of Britain. It may have hopped onto its current orbit at 82au after an encounter with Neptune hundreds of millions of years ago. It was once among the 90,000 scattered objects of smaller size that we estimate currently exist. Among the most unusual of the discoveries are nine little worlds on incredibly distant orbits, never coming closer to the sun than Neptune’s orbit, and taking as long as 20,000 years to travel around our star. Their existence implies an unseen population of hundreds of thousands of trans-Neptunian objects on similar orbits. How these objects got on their present paths is unclear — some orbit so far out that, even at their closest approach, they are barely tugged by Neptune’s gravity. One explanation that has been put forward is that a yet unseen large planet, sometimes called “Planet Nine”, could be causing them to cluster in space. However, our nine minor planets all seem to be spread out smoothly, rather than clustering. Perhaps the shepherding of such a large planet is more subtle – or these orbits instead formed in a different way. The history of our solar system is just beginning to be told. We hope this new set of discoveries will help piece together the story. Queen’s University Belfast (informally Queen’s or QUB) is a public research university in Belfast, Northern Ireland. The university was chartered in 1845, and opened in 1849 as “Queen’s College, Belfast”. The university forms the focal point of the Queen’s Quarter area of the city, one of Belfast’s six cultural districts. It offers academic degrees at various levels and across a broad subject range, with over 300 degree programmes available. Its acting President and Vice-Chancellor is James McElnay, and its Chancellor is Thomas Moran. The annual income of the institution for 2016–17 was £337.6 million of which £79.6 million was from research grants and contracts, with an expenditure of £325.1 million. Queen’s is a member of the Russell Group of leading research intensive universities, the Association of Commonwealth Universities, the European University Association, Universities Ireland and Universities UK. The university is associated with two Nobel laureates and one Turing Award laureate. Gamma ray bursts, intense explosions of light, are the brightest events ever observed in the universe – lasting no longer than seconds or minutes. Some are so luminous that they can be observed with the naked eye, such as the burst “GRB 080319B” discovered by NASA’s Swift GRB Explorer mission on March 19, 2008. But despite the fact that they are so intense, scientists don’t really know what causes gamma ray bursts. There are even people who believe some of them might be messages sent from advanced alien civilisations. Now we have for the first time managed to recreate a mini version of a gamma ray burst in the laboratory – opening up a whole new way to investigate their properties. Our research is published in Physical Review Letters. One idea for the origin of gamma ray bursts [Science] is that they are somehow emitted during the emission of jets of particles released by massive astrophysical objects, such as black holes. This makes gamma ray bursts extremely interesting to astrophysicists – their detailed study can unveil some key properties of the black holes they originate from. The beams released by the black holes would be mostly composed of electrons and their “antimatter” companions, the positrons – all particle have antimatter counterparts that are exactly identical to themselves, only with opposite charge. These beams must have strong, self-generated magnetic fields. The rotation of these particles around the fields give off powerful bursts of gamma ray radiation. Or, at least, this is what our theories predict [MNRAS]. But we don’t actually know how the fields would be generated. Unfortunately, there are a couple of problems in studying these bursts. Not only do they last for short periods of time but, most problematically, they are originated in distant galaxies, sometimes even billion light years from Earth (imagine a one followed by 25 zeroes – this is basically what one billion light years is in metres). That means you rely on looking at something unbelievably far away that happens at random, and lasts only for few seconds. It is a bit like understanding what a candle is made of, by only having glimpses of candles being lit up from time to time thousands of kilometres from you. It has been recently proposed that the best way to work out how gamma ray bursts are produced would be by mimicking them in small-scale reproductions in the laboratory – reproducing a little source of these electron-positron beams and look at how they evolve when left on their own. Our group and our collaborators from the US, France, UK, and Sweden, recently succeeded in creating the first small-scale replica of this phenomenon by using one of the most intense lasers on Earth, the Gemini laser, hosted by the Rutherford Appleton Laboratory in the UK. 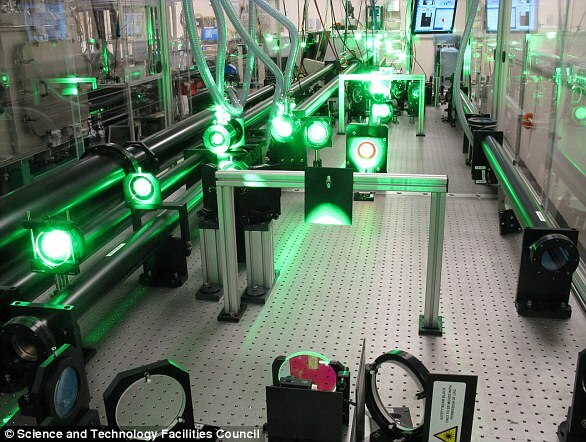 The Gemini laser, hosted by the Rutherford Appleton Laboratory in the UK. How intense is the most intense laser on Earth? Take all the solar power that hits the whole Earth and squeeze it into a few microns (basically the thickness of a human hair) and you have got the intensity of a typical laser shot in Gemini. Shooting this laser onto a complex target, we were able to release ultra-fast and dense copies of these astrophysical jets and make ultra-fast movies of how they behave. The scaling down of these experiments is dramatic: take a real jet that extends even for thousands of light years and compress it down to a few millimetres. In our experiment, we were able to observe, for the first time, some of the key phenomena that play a major role in the generation of gamma ray bursts, such as the self-generation of magnetic fields that lasted for a long time. These were able to confirm some major theoretical predictions of the strength and distribution of these fields. In short, our experiment independently confirms that the models currently used to understand gamma ray bursts are on the right track. The experiment is not only important for studying gamma ray bursts. Matter made only of electrons and positrons is an extremely peculiar state of matter. Normal matter on Earth is predominantly made of atoms: a heavy positive nucleus surrounded by clouds of light and negative electrons. Artist impression of gamma ray burst. NASA [no additional credit for which facility or which artist]. Due to the incredible difference in weight between these two components (the lightest nucleus weighs 1836 times the electron) almost all the phenomena we experience in our everyday life comes from the dynamics of electrons, which are much quicker in responding to any external input (light, other particles, magnetic fields, you name it) than nuclei. But in an electron-positron beam, both particles have exactly the same mass, meaning that this disparity in reaction times is completely obliterated. This brings to a quantity of fascinating consequences. For example, sound would not exist in an electron-positron world. So far so good, but why should we care so much about events that are so distant? There are multiple reasons indeed. First, understanding how gamma ray bursts are formed will allow us to understand a lot more about black holes and thus open a big window on how our universe was born and how it will evolve. But there is a more subtle reason. 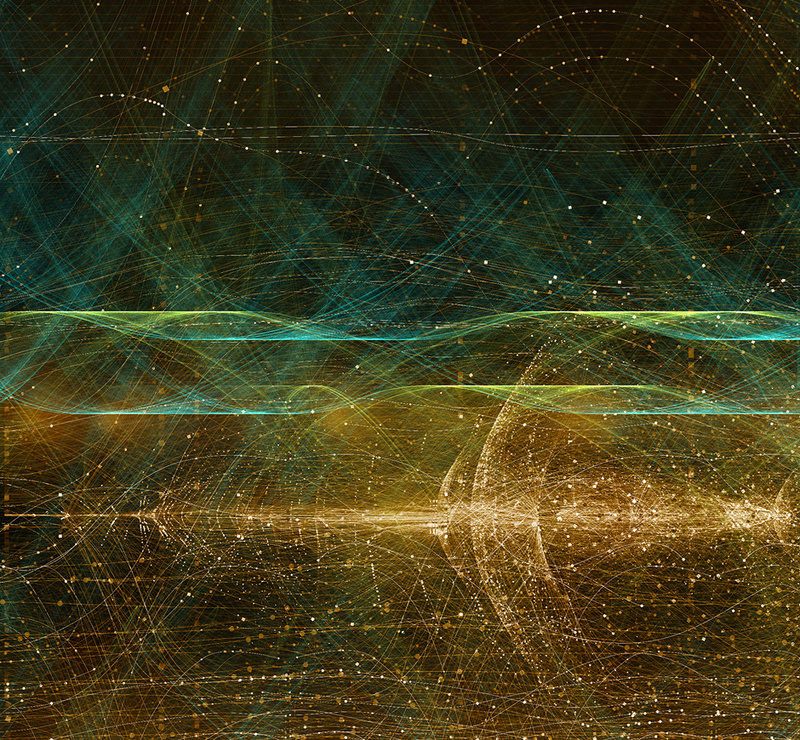 SETI – Search for Extra-Terrestrial Intelligence – looks for messages from alien civilisations by trying to capture electromagnetic signals from space that cannot be explained naturally (it focuses mainly on radio waves, but gamma ray bursts are associated with such radiation too). Of course, if you put your detector to look for emissions from space, you do get an awful lot of different signals. If you really want to isolate intelligent transmissions, you first need to make sure all the natural emissions are perfectly known so that they can excluded. Our study helps towards understanding black hole and pulsar emissions, so that, whenever we detect anything similar, we know that it is not coming from an alien civilisation. Queen’s is in the top one per cent of global universities. With more than 23,000 students and 3,700 staff, it is a dynamic and diverse institution, a magnet for inward investment, a major employer and investor, a patron of the arts and a global player in areas ranging from cancer studies to sustainability, and from pharmaceuticals to creative writing. Queen’s is a member of the Russell Group of 24 leading UK research-intensive universities, alongside Oxford, Cambridge and Imperial College London. The Research Excellence Framework (REF) 2014 results placed Queen’s joint 8th in the UK for research intensity, with over 75 per cent of Queen’s researchers undertaking world-class or internationally leading research. The University also has 14 subject areas ranked within the UK’s top 20 and 76 per cent of its research classified in the top two categories of world leading and internationally excellent. This validates Queen’s as a University with world-class researchers carrying out world-class or internationally leading research. The University has won the Queen’s Anniversary Prize for Higher and Further Education on five occasions – for Northern Ireland’s Comprehensive Cancer Services programme and for world-class achievement in green chemistry, environmental research, palaeoecology and law.